For the past few years, Vaseline for acne has received its own Reddit threat. The people at the Skincare Addiction sub-Reddit are completely obsessed with petroleum jelly. They swear by it, and they are certain that Vaseline helps with the treatment of acne. But is there any truth to that theory? We take a look at both the positive and negative side of the story. How to use Vaseline for acne? For many years, there was a belief that Vaseline (petroleum jelly) can clog your pores and lead to breakouts and blackheads. But a layer of Vaseline is not the reason why acne appears. The Vaseline for acne theory is known as “slugging”. That is the name for the technique used. Basically, it involves slathering slather some occlusive moisturizer, which is Vaseline or any other petroleum jelly based product that does not actually moisturize. Instead, what Vaseline does is create a barrier on your skin, and trap hydration inside. The theory suggests that Vaseline prevents water and moisture from escaping your skin. You have to apply Vaseline over your usual moisturizer at night. According to supporters of this theory, the Vaseline or petroleum jelly product will make your moisturizing cream, serum, or lotion, 10 times more effective. For people with acne, Vaseline makes sure your skin is well-lubricated and allows the skin barrier repair itself. What is petroleum jelly made of? 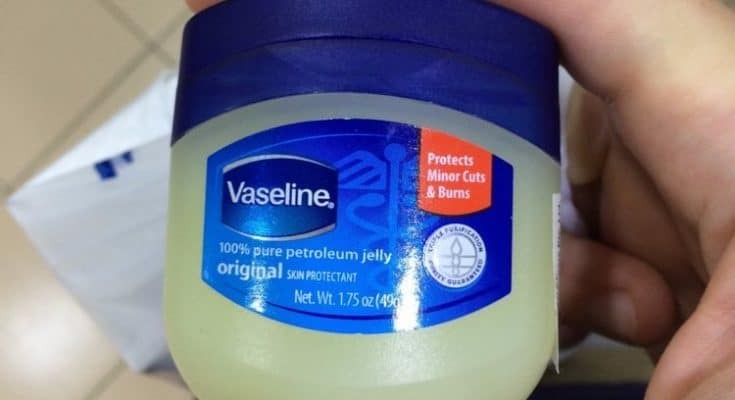 Vaseline is a petroleum jelly product. And what is the jelly made of? It is a mixture of mineral oils and waxes, forming a semisolid jelly-like substance. The product was first discovered by Robert Augustus Chesebrough in 1859 and hasn’t changed much ever since. He noticed that oil workers used a gooey jelly to heal their wounds and burns. He packed the jelly as Vaseline, and the world has changed with that. The benefits of the jelly come from the main ingredient, which is petroleum. This ingredient helps seal your skin with a water-protective barrier, helping your skin heal and retain moisture. What are the “haters” saying? There are two sides to every story. And that applies to Vaseline for acne as well. While there are many supportive stories on Reddit forums, you will also find people that simply do not believe there is any truth to the theory Vaseline helps with acne. You might call them haters, but they are just trying to find the truth. Some dermatology experts say that because petroleum jelly is inherently comedogenic, it can clog the pores. And instead of healing acne, it will cause acne. And while petroleum jelly has some anti-inflammatory effects, it can diminish the look of redness, it might not heal your acne. With that in mind, here are some other potential side effects of using petroleum jelly for acne.